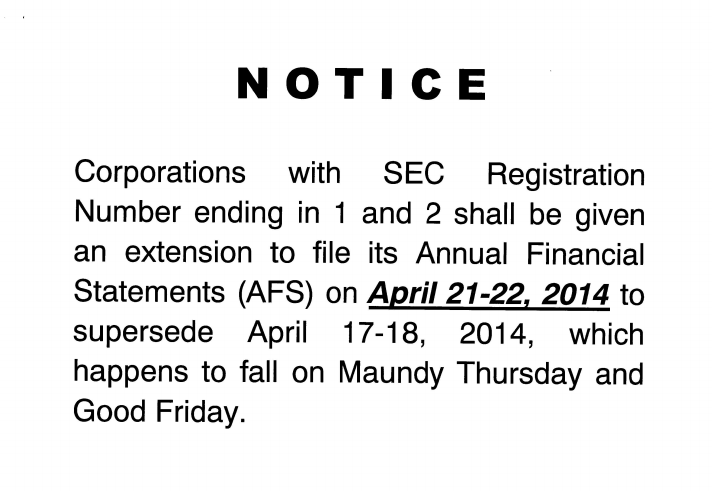 The Securities and Exchange Commission on Tuesday, March 11, 2014 issued a notice informing the public that corporations with SEC registration number ending 1 and 2 shall be given an extension on the deadline in filing their financial statements until April 22, 2014. April 21 and 22 were assigned to replace the April 17 and 18 which are falling on Maundy Thursday and Good Friday. Before April 14, 2014, same as the old rule, everyone can file regardless of the last digit of the SEC Registration number. So why wait for the deadline?